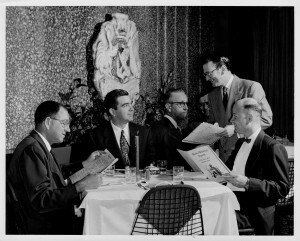 In 1949, amid the city’s booming economy and population growth, the Peacock Grill opened— giving Houstonians a new kind of culinary experience. Max Manuel and Camille Bermann opened their fine dining establishment in downtown Houston filling the niche for continental cuisine. The name was soon changed to Maxim’s, and a Houston legend was born. Bermann based the new name and the design concept on the world-renowned restaurant Maxim’s de Paris. For over fifty years, Maxim’s provided sophisticated food and dining to its loyal patrons, introducing Houstonians to fine French cuisine and wine. In its December 1999 issue devoted to the best of Texas in the twentieth century, Texas Monthly food critic Patricia Sharpe described Maxim’s as the “Restaurant of the Century.” The restaurant earned this distinction in large part because of proprietor Camille Bermann’s legendary demand for perfection in food, wine, and service. Born and raised in Luxembourg, he trained in Brussels learning to make pastries; soon he was working at the Ritz in Paris. In 1939-1940, under the tutelage of Henri Soule, Bermann travelled to the United States to work at Le Pavillion restaurant in the French Pavilion at the New York World’s Fair. By this time, the twenty-five-year-old Bermann had a lifetime of experiences that he eventually shared with Houston.